When a hip-hop artist hits the stage at a bar in a college town, the audience might be surprised to hear lyrics about faith, purpose and hope within catchy, danceable tunes. Muncie, Indiana based rapper Chris Mack is shattering stereotypes by bringing positive music to the masses. “I love being able to perform places you wouldn’t expect me to be. I rap about my faith in Christ, and most people would expect me to be rapping at a church, but my goal is to reach people from all perspectives on life for the sake of understanding what they believe and getting to share what I believe through not only music, but conversation,” said Mack, a Ball State grad who says music has been in his blood from day one. As a child, he would soak up the hip-hop and ’70s soul music that his father played on repeat. When his family purchased their first home on the south side of Indianapolis, he watched his father and grandfather convert its garage into a music studio so that his father could write and record his own tracks. As Mack got older, he took his father’s old beats and made original songs with them. Today, the emcee does shows everywhere, from community centers and churches to parties and bars. As a student, Mack was involved in campus ministry through Cru, an interdenominational Christian organization for college and university students, and Impact, a similar organization targeted toward African-American students. In Muncie, he works with youth at the Boys and Girls Club and serves at a church that some of his friends planted in Muncie. By the end 2017, Mack hopes to be making music full time and performing outside of the Midwest. While living in Muncie, he wants to make sure that he continues to serve the local community and cultivate the connections he has made. To listen to Chris Mack’s music, visit realchrismack.bandcamp.com or youtube.com/realchrismack. 9 Animated Rebels Cheers To The G.O.A.T. To listen to Holy Hip Hop Mobile Top 10 at Noon Monday Through Sunday on ChristianRadio.com, click/copy/paste the following link in your web-browser: -- or visit: www.CHHRadio.com. Ric Flair, Arn Anderson, Ole Anderson, and Tully Blanchard, better known as the Four Horsemen, were the biggest threat in the mid 1980’s era of the National Wrestling Alliance (NWA). In every NWA promo they talked trash about the competition, flaunted their title belts, and backed up their trash talk in the ring. Their tight knit group has been described as the reason the NWA survived as long as it did. Although the wrestling league is no longer around, the legacy of The Four Horsemen is long lasting and has inspired battle rap’s Christian artists whose rap group goes by the same name, but stylized with Roman Numerals. Th3 Saga (a URL battler who came up from URL’s Proving Ground), A-Ward (who battles mostly on King of The Dot and is in the running for the KOTD championship chain), Street Hymns (a backpacking wordsmith who battles on Bullpen Battle League), and Loso (a free agent who many believe is the next guy to take over battle rap) are The IV Horsemen. And although the name their team bares is a wrestling and not a biblical reference, the quartet does share one thing in common – their religion. Th3 Saga, born in Brooklyn, New York, got his start in battle rap on the Smack/URL platform. He quickly got recognized as one of the top battlers of his class because he has a different approach to battling. What set him apart from his class was how he was able to entertain battle fans while subtly passing along a God inspired message. Battle rappers today center their lyrics on insults, personal attacks, jokes, and above all, gun lines. The ten gauge, the nine, the blickie, the AR, the “gun so big I had to drag it home.” All these different schemes rappers use to dramatize their arsenal and the fans not only eat it up but demand and expect it. So how do Christian rappers fit into this scene? Although the 26-year-old rapper has experienced things relevant to the battle culture, he found his way out of it and found his calling with God. But still, Saga doesn’t omit his past when preparing for a battle. “I want to speak to you in your language. I want to leave you with something substantial enough that when you weed past the gun bars, when you weed past the nonsense, you’re going to gain something that you could actually go home with [and think] ‘that’s crazy.’” said Saga. Th3 Saga’s religious background is traceable back to his grandfather who has his own church in Brooklyn, the same church Saga grew up in. The same cannot be said for Loso, who didn’t find religion until his early 20’s. Raised on rap music, Loso didn’t touch a mic until after he found Christianity – so his lyrics always carried a religious message. In his first ever battle in 2015, Loso sent shockwaves throughout his hometown of Tampa, reaffirming that he was on the right path that eventually led him to Street Hymns. Loso went on to win the competition, and although there was no talk at the time of forming a group, Loso and Street Hymns did make a connection following their battle. The last of the Horsemen is A-Ward, a Knoxville native currently residing in Kansas City, whose older brother introduced him to Nas and the Wu-tang Clan at a young age. Like Loso, when A-Ward took up rap he had already found his faith. In his early teens, A-Ward started going to church and rapping around the same time. “In high school I became familiar with Smack DVDs through my older brother. In 2002 I became a fan of battle rap – I watched it for over 10 years before I started [battling],” A-Ward reveals. In 2015, A-Ward got his first battle and has continued to climb up the King of the Dot ranks currently chasing the championship chain currently held by Head I.C.E.. In a lot of ways, although Th3 Saga was the founder of the group, Street Hymns was the connection that brought everyone together. A-Ward had already heard of Street Hymns just off the buzz he was creating in Dallas and linking up through mutual friends. Street Hymns cosigned A-Ward when speaking to Saga who linked with A-Ward via social media. 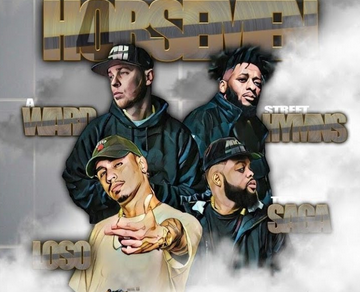 Street Hymns also had the connection to Loso from the rap competition, so it was only a matter of time before the four artists banded together. Rather than just call themselves The IV Horsemen and make their rounds in the battle scene, they want to try something more ambitious. The group plans to organize a nationwide tour – performing their music, 2 on 2 battles, selling merchandise and ending each show with a panel discussion to talk about faith. Aside from performances, the four rappers maintain a group chat where they pray for each other, offer advice, provide words of wisdom, and “sharpen each other’s swords,” Loso says, meaning keeping each other on point not with just battling but being better men in all aspects of life. Having already planted seeds in the battle leagues, only time will tell how far The IV Horsemen take their careers.